When people think of sharks, they usually picture terrifying sea monsters. However, sharks have proven to be among the most intriguing aquatic animals. There are about 375 types of sharks in the fish family. Sharks are different from other fish in a number of ways. First, their mouths are underneath their bodies. Also, unlike fish, sharks do not have a swim bladder to help them float; so if they stop moving, they sink. Additionally, sharks have five to seven gills on each side of their bodies, while most fish only have one per side. 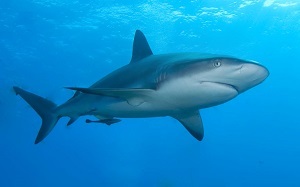 Sharks further differ from most fish because their skeletons are made of a flexible material called cartilage. Finally, while most fish have scales, sharks' bodies have tough skin that is covered with tiny teeth denticles. Shark's five senses are different from those of humans. Their vision is very good because their eyes have plates that help them see better in deep water. In bright light, these plates get darker and work like sunglasses. Sharks smell by detecting scents in the odor particles that flow into their noses. They can follow these scents to track their prey. Sharks have an interesting way of tasting. They have taste buds all around their skin. When they rub up against something, their taste buds help them detect whether or not it's food. Sharks also have the ability to feel sound vibrations and pressure changes in the water through two lines of hair running from their noses to their tails. Additionally, they can feel electricity through their muscles, which help them find their food. Sharks are also a unique species because of how they breed. There are two ways sharks lay their eggs. Some sharks leave their eggs on rocky surfaces to hatch. Others hang them on seaweed by small strings on the egg. Some sharks don't even lay their eggs in the outside world. Rather, the eggs hatch in the mothers' womb and come out as live babies called pups. These sharks have a better chance of survival. Sharks have been around for thousands of years. Along the way, they have gained a bad reputation; however, they don't attack as often as people think.